Tools, insights and people—there's always help available when and how you need it. Starting your first job, retired or somewhere in between? What you need to know to be retirement-ready. 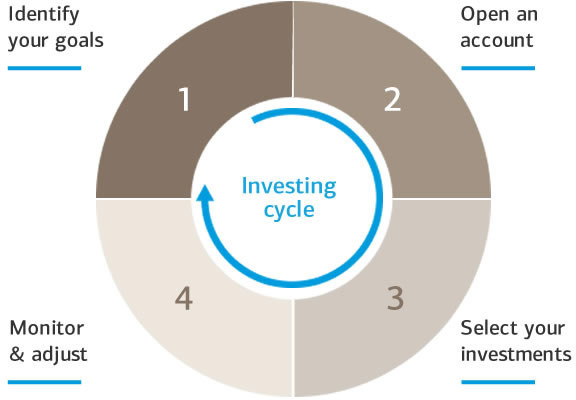 How do you find the funds to start investing? First, get a handle on your finances and practice savings habits. Learn how to balance competing financial goals during your peak earning years. It's a sprint to the finish line. Assess where you stand today and make the most of the time you have to invest. These strategies could help you stretch your funds throughout your retirement. Investing is an ongoing process: Prioritize your goals, select investments, and make adjustments to help you stay on track. See how we can help. What's in your future? We'll help you prepare for life events related to home, family, finances, health and work. Did you know that there are two ways to move assets from one IRA to another? The most common is a transfer. This is when you transfer assets from an IRA held at one financial institution to an IRA at another. You may directly transfer assets between investment firms as frequently as you wish. The second, less common approach is called a rollover. Rollovers occur when you withdraw assets from an IRA and then "roll" those assets back into the same IRA or into another one within 60 days. IRS rules limit you to one rollover per client per twelve month period. If you have questions or want to learn more call 888-MER-EDGE or consult a tax advisor. A direct rollover occurs when you request that a rollover check be made payable directly to the new custodian for the benefit of your individual retirement account (IRA) or employer-sponsored retirement plan. A direct rollover is not subject to tax or penalties. An indirect rollover occurs when you request that a rollover check be made payable to you, after which you deposit the money into your IRA or another employer's retirement plan within 60 days. When such a distribution is made by the plan, the plan is required by law to withhold 20% of the taxable amount for prepayment of federal income taxes. If you wish to roll over the entire distribution, you must make up the 20% withholding out of your own funds, or you will be subject to income taxes and possibly early withdrawal penalties on the shortfall. If you fail to complete the rollover within 60 days, all or part of the money distributed to you will be taxable and a 10% additional tax for early withdrawals may apply.